Woodstock, home to the celebrated Blenheim Palace, a UNESCO World Heritage Site, is situated in the beautiful Glyme Valley on land that would once have been part of Wychwood Forest. The land was called a Royal Forest in the Domesday Book, at which time it would have stretched all the way from the Cotswolds to London. Woodstock the town takes its name from the Anglo-Saxon for 'Clearing in the woods'. The town is roughly split into two parts. North of the river Glyme is Old Woodstock, a Saxon settlement. Legend has it that King Alfred stayed here in 890 and that Ethelred the Unready held an important council in the town. Henry I established a deer park around Woodstock Manor and it was here, at a long-since disappeared medieval palace, that he seduced the infamous Rosamund. He is said to have housed her in a bower in the park near the well-known and much-visited Rosamund's Well. The palace, whose last remains were demolished in 1710, is said to have been the birthplace of the Black Prince in 1330. It was badly damaged during the Civil War when the town was a Royalist stronghold and it was here, in a gatehouse because the main house was too dilapidated, that Elizabeth I was kept prisoner for a year while her sister Mary was on the throne. On the opposite side of the river from the old Saxon settlement is a town that Henry II developed in the 13th century to serve the Royal Park, which would have contained hunting lodges for English Kings long before the Norman invasion. In 1179 King Henry granted Woodstock a charter to hold a weekly market and the town prospered over the coming centuries as a centre for glovemaking. A pair of gloves was traditionally presented to each visiting monarch and Woodstock Gloves factory and showroom is now open to visitors. New Woodstock grew into an important coaching station and many of the old inns still survive. To get a real sense of life in the county over the years head to the Oxfordshire County Museum, housed in the 16th century Fletcher's House. At the entrance to the museum stand the old town stocks and the museum's tranquil gardens are a welcome haven for exhausted visitors. Many of the buildings in the town date from the 17th century and the church of St Mary Magdalene, although rebuilt in the 19th century, features a Norman doorway, ancient English windows and a musical clock that plays a tune on the hour every hour. 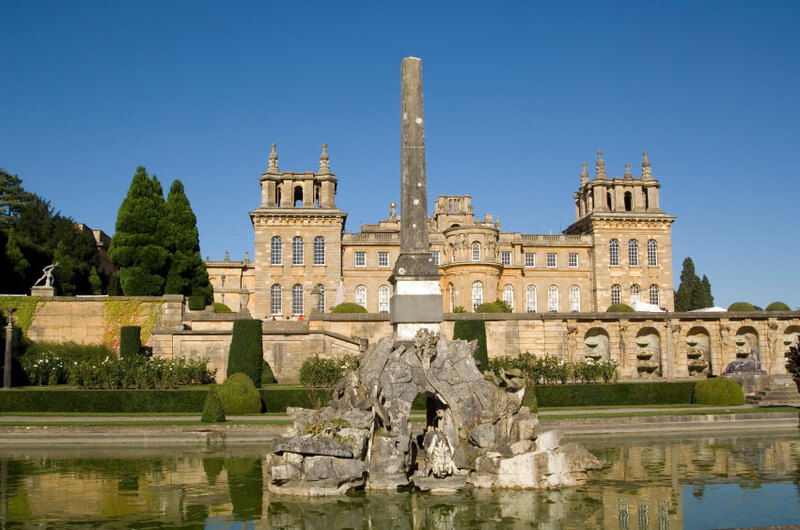 Today the town largely thrives on tourism generated by the magnificent Blenheim Palace Estate. Set in 2100 acres of beautiful parkland landscaped by Capability Brown, the palace was granted World Heritage Site status in 1987. Built between 1705 and 1722 on the site of the former medieval palace the land and the cost of building were a gift from Queen Anne to John Churchill, first Duke of Marlborough, in recognition of his victory at the Battle of Blenheim during the Spanish war of succession. The architect chosen by Churchill was the relatively unknown John Vanbrugh, whose biggest claim to fame was that he'd spent time imprisoned in the Bastille in Paris. He designed an impeccably grand Italienate palace that was ridiculed at the time by writers such as Johnathan Swift and Alexander Pope. Churchill's wife, Sarah, is said to have been so unhappy with the result that she withheld Vanbrugh's payment for some years. The palace is a lush affair, with hand-painted ceilings and masses of top-quality paintings, porcelain, silver and furniture. It was the birthplace of Sir Winston Churchill, a cousin of the Duke, in 1874, who is buried not far from Woodstock in a village called Bladon. 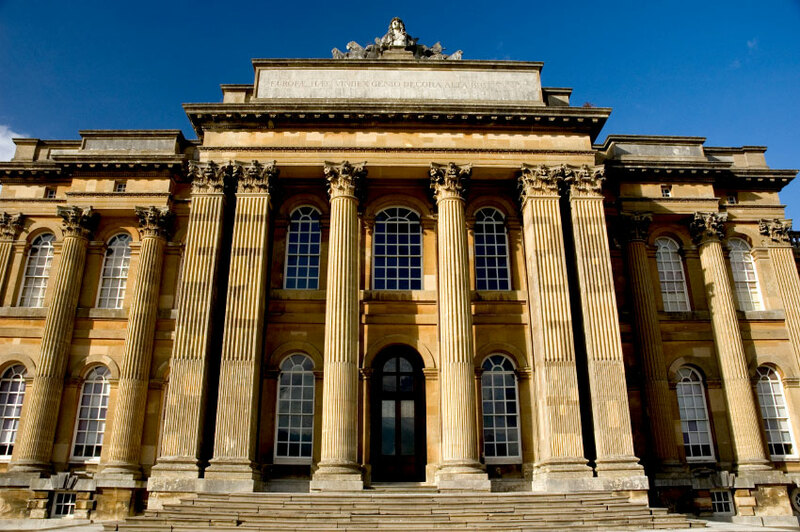 Blenheim palace grounds are open daily to the public and the palace is available for corporate and private events. In 2008 the grounds saw the first 'Wakestock Festival', a three day fusion of music and wakeboarding whose line-up featured The Streets, Groove Armada and Supergrass.